Oldham band Inspiral Carpets were one of the opening acts on stage at Hylands Park in Chelmsford, Essex ahead of a headline performance by the Stone Roses. The split-site festival, now in its 17th year, is run across two days at the Essex venue, and Weston Park in Staffordshire. Also appearing at the event are Salford act Happy Mondays, and Noel Gallagher - a fellow Mancunian who was inspired by the Roses - and his High Flying Birds. 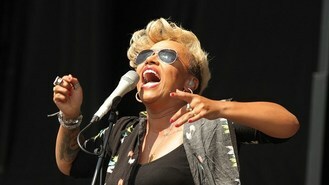 Scottish singer Emeli Sande, fresh from her appearance at the Olympic closing ceremony, performed to a huge crowd at the main stage at Chelmsford. The Brit Award-winner donned aviator shades to shield her from the blistering sun as she opened with her hit Heaven. Other artists on the bill for the two-day Virgin Media-sponsored event are The Killers, Snow Patrol, Sir Tom Jones and X Factor judge Tulisa Contostavlos. US singer Nicki Minaj cancelled her appearance at the last-minute, however, after suffering from "vocal chord issues". Celebrities spotted enjoying cocktails and afternoon tea in the Louder Lounge VIP area at Hylands Park - decked out to resemble a traditional English village with bunting and a duck pond - included One Direction heartthrob Louis Tomlinson, Spice Girl Emma Bunton and funnyman Leigh Francis, better known as his comedy alter ego Keith Lemon.